After I finished printing some bookplates, I went back to work on my latest supermarket block. More cars today. 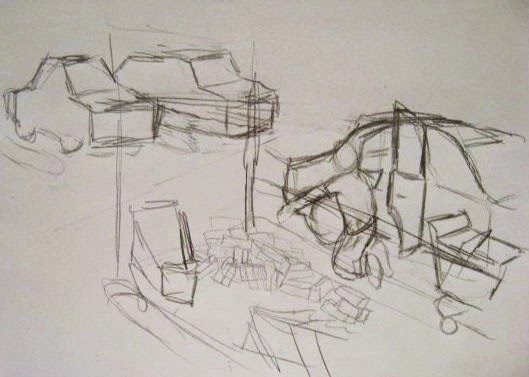 Since it was a warm and sunny day, I just took the block out to the parking lot of the Studio building and started sketching specific cars over the place holder designs I had. The two across the aisle from the brick guy are based on vehicles owned by the people who run the building, and the three in the upper left corner are just three random cars that were parked together and at an angle suitable to be in that space. Don't know yet what I'm going to do with the upper right corner, and I still have to deal with the details of the brick pile, as well as throw in a pedestrian or two. But I hope to be ready to start cutting in a week or two. I spent days last week looking for my plastic model pick up truck and eventually found it, after I had given up for the day on trying to find it and started looking for something else. I don't know that if I had remembered Daryl Zero's advice about looking for things sooner whether my search would have been shorter, but in the end the results were good. Besides my truck, one of the things I found was a shoe box with all my mini prints. These are small prints packaged with backing boards and inside comic book bags, priced low for purchase at arts and crafts type sales. And over the years I've moved quite a few of them. Still another week or so to go in the show of student work at the Belmar Arts Council, which will be followed by the annual WUF show. That stands for Wearable Usable Functional, a collection of stuff suitable for holiday shopping. I wasn't planning to participate, but suddenly I had this supply of inexpensive small prints. My inventory includes a bunch of mini-saints, which are small versions of some of the more popular saint prints from that series, but those are essentially small fine art. The truly WUF item would be some of my bookplates. Don't know if there is much demand for such things in the age of e-books, but if not at this thing, where am I going to sell them? My stock included one assortment set and several 4 packs of 4 different designs. I confirmed a few days ago that I still had a block with four assorted designs, but no 4 packs of one of the more popular individual ones, so I decided to do some manufacturing today. The design I was short of was one involving bees. It had started out as a panel in my Fourth of July series (a warm fall day when the bees came out of cold weather hibernation and, not finding any flowers, were swarming all over a spilled soda), and was later reworked as a color image in my saint series (both regular and minis), and then as a bookplate. For paper I use a nice laid resume paper, also found there in the Studio. My can of Outlaw ink, designed for fine details, seemed ideal. It didn't take long to print several of the bee plates, enough to make their own 4 pack, and they'll dry in plenty of time. I won't worry about printing more of any of these until some of them sell. Had some woodcut related supplies and equipment in my car leftover from this week's 2D class (their woodcut project) so I decided to drop by the Studio where I normally store this stuff. And as long as I was going there, I figured I may as well advance the current block a little bit. Today the focus was on wheeled objects in the mid ground of the image. I adjusted the overall shape of the brick guy's car on the left side, redoing the overall shape of the roofline and the open door, based on the original profile sketch I had of the car I based it on. I also made changes to all the shopping carts, based on further mental notes taken the last time I went to supermarket where the incident took place. Started thinking a little bit about how the value is going to be arranged in the image, but there are still some unresolved sections of the block so that those decisions will wait a while. For the second time this month, my visit to the Studio was not about working on the latest print, but rather because of my college teaching career. Once again my 2D and drawing classes have intersected in what they are doing, and during the week both did a graded charcoal drawing. It has become my practice to start the grading process of still life drawings right there in the classroom, scoring a few aspects (out of 6 or 7 categories) while looking at both the drawing and the set up from the student's point of view. Other aspects can be judged later. For example, the accuracy of the shapes of objects I can judge later because all these things were brought from home and so I know what they look like. And the combination of my big table and the chance not to bring all those dirty charcoal drawings into my apartment makes the Studio the ideal place to do this, so I completed the grading of two classes worth of drawings. 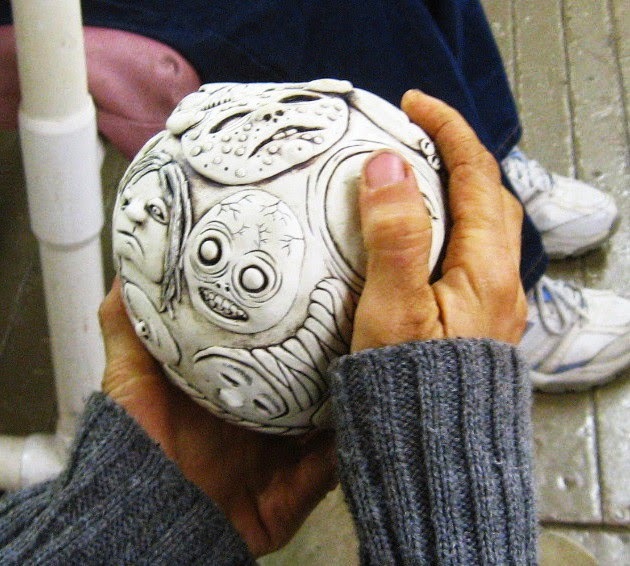 Next week the 2D class moves on to woodcut then color, while the drawing class will start ink wash then conte crayon, so this will be the last time this semester that both classes are dealing with the same process. Still a bit rainy this morning (reports were about 4" total had fallen in the area yesterday), but now just light showers and sprinkles. I could have continued working from home, but I felt like getting out of the house, so around mid-day I packed up the block and some supplies and drove up to the Studio. When I arrived the block looked as it does in the above photo- like the last time I showed it, plus the truck sketch that I had started. I started on that truck, which occupied much of my attention yesterday. I brought the model truck with me. Kept it in the same place on the block, but spent time adjusting the shapes, proportions, etc to make it more accurate. Next I redrew the tree in the background, from a sketch I had made of one of the actual trees in that lot. I went back to my sketches of the brick guy and redrew the figure to better match my original self portrait sketch. I fixed up all the shopping carts in the area, and some of the details in my shopping cart corral area. Made some minor adjustments to the other cars in the scene, though all will require more work. 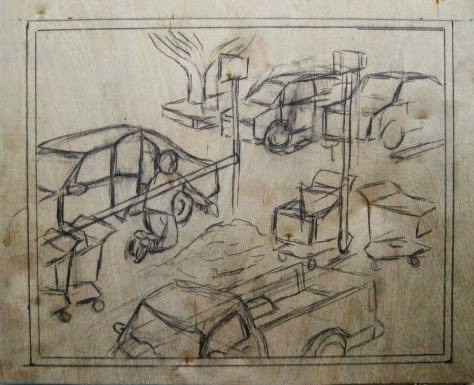 Roughed in a few possible vehicles in the upper left corner. Something is needed to function as background in this area but whether it's this or something else has yet to be determined. When I ended the Studio session, the block was at the state below. I brought it home to look at, and will continue with the drawing of it over the weekend. I think it's coming together and this will eventually fit well with the rest of the series. On another topic, while there I checked those proofs that I pulled last week with the new ink. All dry and looked fine. The coloring experiments can wait until another time. And I picked up the crate of bench hooks I made for my woodcut class. It won't be running this fall, but I'l make them available to my 2D class on Monday for them to use on our woodcut day. Had some very busy days over the past week, so today I need to catch up on some things going back to the weekend. 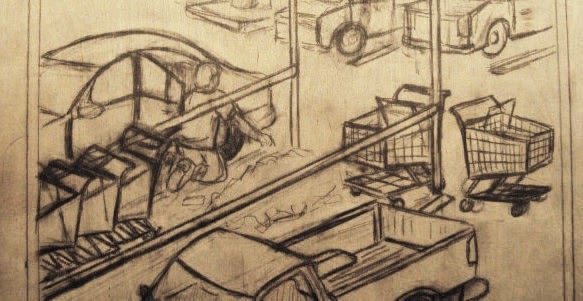 On Saturday afternoon I went up to the Studio and started working on the sketch for the new supermarket block. I liked the orientation of the last paper sketch, so I decided to reverse it so that the print would look the same. I traced the back of the paper sketch to get the mirror version and copied from that, keeping everything about the same size. One issue that I ran into was that the wood is a little larger than the sketchpad I had used, and using my standard supermarket print size, the resulting drawing did not quite fill the space. Not liking the idea of just having an hunk of empty parking lot there, I decided it would be best to put in another vehicle. However, I didn't want said vehicle to block the view of the pile of bricks and rubble or the loose carts. The solution I came up with was to put in that space a pick up truck. 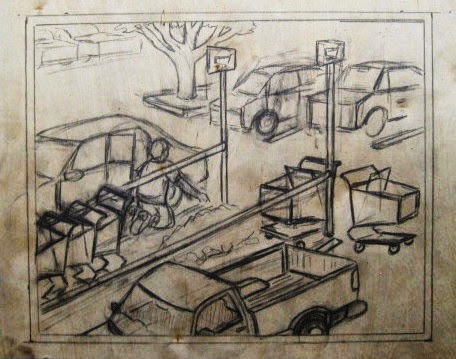 The tallest part, the cab, would fill most of the space in the lower left corner between the carts and the brick pile, while the less tall truck bed would slide under the bricks and loose carts to the right. And I even had a perfect reference to use. My father had enjoyed building scale models from plastic kits in his youth- when I was little some of these were still around in his old bedroom in the house he grew up in. No surprise that he got me into the same hobby while I was still young. He did most of the work in the earliest days, which may have been as much about him still enjoying the hobby, but eventually I took over the whole process. About half cars, half planes, usually warplanes which were always a lot more interesting than civilian aircraft. (we did make a DC-10, the kind of plane we took on a family trip to California when I was in first grade) The last ones were probably somewhere in the high school years, when drawing became my main creative outlet. I don't know how many were saved from when they emptied the family home (a Spider-Man scene did make it down the shore, and was sold at a family garage sale for a few bucks to a guy who remembered building the same one as a kid and was reacquiring a bit of his past), and Hurricane Sandy destroyed a lot of stuff that was moved down. Jump forward to the late 90's and a visit to the Pearl store in Woodbridge. It occupied a large retail space which gave them room for a lot of hobby stuff, such as doll houses (and accessories) and plastic model kits. 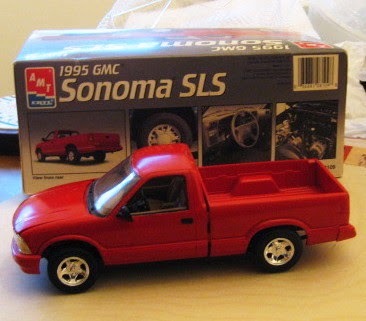 One day they had a clearance sale display near the front door of model kits and I saw a familiar car- a 1995 GMC Sonoma pick-up, which was the identical twin to the 1996 Chevrolet S-10 that I owned at the time. Couldn't pass up the opportunity to build a car that I actually owned. I eventually picked up a small can of red spray paint for the body and an assortment of the familiar Testors bottles for everything else (a color booklet Chevy put out at the time I bought the truck had great photos of the undercarriage, making it easy to get accurate results) and it didn't take long to make my own little truck. Being able to see a 3D model of the vehicle from whatever angle would be needed would make it easy to put an accurate truck in at exactly the perspective I needed. Unfortunately, it had not turned up in any of the places I had looked for it in recent days. I knew that it had survived the move to my current residence, having used the model and instruction sheet as part of demonstration of car building as part of a project for my 3D Design class last fall and spring. The weather today was miserable, a heavy rain already falling before I was even out of bed and continuing as a nor'easter decided to hang out over Jersey all day. A good day to work inside, and I devoted a few more hours to trying to get my reference. More unsuccessful searches for the built model, and looking at hundreds of images on the web, none of which where from the angle I needed. And it was way too wet to try to draw from an actual truck. So I gave up my model search for the moment and started looking for particular old magazine references (relates to a current class I'm teaching) and of course within minutes I found the model. On a high shelf at the back of my bedroom closet. Not sure why I chose to store it there, but I'm sure it was part of the cleaning I had to do in preparation for a cable re-wiring that went on over the summer. A quick rough sketch showed that it would fit exactly like I had expected. The storm is expected to still be here tomorrow, so whether I drive up to Ocean Grove or just work at my kitchen table, it will be a day for drawing indoors. Results will be posted tomorrow. Having finally received my new can of relief ink after its tour of New Jersey, the next step was to try it out, and see if this is something I might use for myself, for my class, etc. So I brought it to the Studio, figuring I'd find an old block or two to print. And I did, as well as find some scrap paper I could use. I opened the can, used my ink knife to cut through the edge around the paper covering the ink, and lifted it out in one piece. The ink was much stiffer than I expected, more like a litho ink than any relief ink I've ever used. However, I did remember in the advertising for it that it was formulated specifically to cleanly print fine line art of the type Tom specializes in for his prints. So I pulled a little bit from the can and worked it with my knife a while to loosen it up. Then I got out a hard brayer and gave the stuff a practical test. 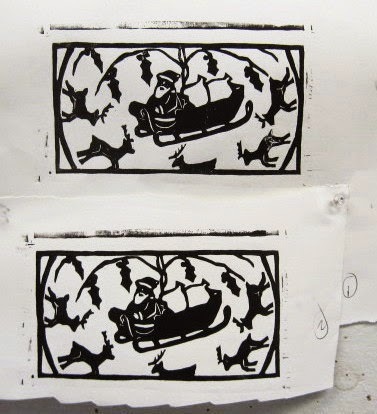 First up was an old Christmas card block, a famous Ancient Greek black figure pottery image reworked as a Santa scene. This ink has less oil than what I'm used to, so it wasn't as obvious where the fresh ink had been applied over the dried ink (more than a decade old) on the block. 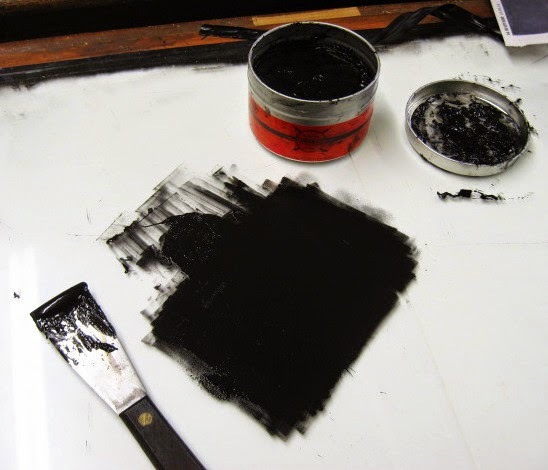 And it didn't appear that I had much ink on the brayer. But I decided I had given it a good inking and printed it on a scrap of stiff Strathmore drawing paper. Printed it with a wooden spoon (the go to tool for my Belmar students) and it came out just fine. There were a few small spots that I had missed, so I gave those spots extra attention on the second proof. In each case I got good crisp prints picking up every detail of the relief. The second test would be a saint print on Rives Lightweight, another common use for me. I had planned to pull another copy of the most recent, Bd James Strepar, but that block wasn't in the Studio (found it at home later that day), so I went with Pamphilus. I had colored 3 copies of the print originally, but the one I liked best was damaged in the clean up following the flood we had over the winter- looking like many droplets from spraying or mopping as it sat in my drying rack. So I had a reason to need another one of this saint on the proper paper. Again, not easy to see the ink on the brayer or on the block, but it printed easily enough, and once again with crisp detail. In both cases I got a good solid black. The testing phase is not quite over yet. I want to see how long they take to dry, and make sure that the ink dries evenly. And then I'll make sure it holds up to the effects of coloring with watercolors. And before I declare this my official ink I may test one or two other options. But now I know that this is one of my options. Early in the semester, when I was still covering university printmaking classes, I spent time looking up information about printmaking supplies so I could share it with the students. The regular professor had put some on the syllabus I handed out, but I have additional knowledge and wanted the kids to know all the possibilities. So I went to the Daniel Smith website to check on some of the things I know that they carry and was hit with a bombshell. The current company president was announcing their plans to end production of their art supply catalog and the online ordering system. The plan is to return to their roots as a manufacturer of artist supplies, which they will still sell, but mostly through other art stores. This is a major inconvenience, but things I bought from them that they don't make themselves are available from other suppliers. But I figured I could still get my relief ink, since the company was founded by a group of printmakers specifically to make better quality printing ink than was available anywhere. However, they decided to ignore those actual roots (which were still bragged about elsewhere on the website) in favor of fictitious "roots" as paint company. So they will keep making paints, but had already discontinued all ink production, just selling off the remaining stock, and my relief ink was long gone. It was bad enough that the ink I had been using exclusively for 20 years was no longer being made, but these wannabe painters were lying to customers in calling this "going back to their roots." I called their customer service line to see if I could get more information, and was told that many of the employees were baffled by the decision (many are printmakers themselves). The printmaker I met last week had lived in Seattle for a while and had taught print classes at one of their stores. She was aware that the catalog was ending, but was shocked to learn that they were ceasing production of printmaking supplies. Maybe someday they will realize the error of their ways, but I resigned myself to the idea that I need to find a new ink and soon. I do have a can and a half left, which lasts me a while, but I also use it in teaching my woodcut class (I start them on water based inks, but they all want to switch to oil based inks as soon as possible) and that's scheduled to start up again next week. My old friend and former student Tom Huck had favored it for a long time, but I had noticed on his site a few years ago that he was promoting Gamblin brand inks- I assumed some kind of financial arrangement had been made. But then earlier this year he announced that he would be having his own custom label brand of relief ink, manufactured by Gamblin, called Outlaw Black. (Drive by Press, headed up by one of Tom's former students, also has a custom label ink formulated for relief printing on cloth) The company website doesn't list these custom label inks, but my tool supplier does, so I ordered some tools a few weeks ago and had them include a can of Outlaw Black in the shipment. If I like it, I'll order some more. The problem has been waiting for the stuff to get here. It was sent parcel post (relatively cheap), and after the first weekend it finally departed the west coast. A link to tracking information allowed be to follow the progress. It arrived in New Jersey toward the end of last week, at which time the post office inexplicably sent it to a different town than the listed address. That town is just across the river from where it was supposed to go, but the tracking site told me it was declared undeliverable, and after a weekend in a post office closed for the holiday, it was forwarded to the other side of the state. For a few days I was left wondering why it couldn't be delivered- was it damaged, the labels destroyed, etc? I was worried that maybe it would be sent back to the company. Yesterday morning the computer told me they had decided to send it to the town it should have been sent to last week, and I got confirmation that it had arrived. During the day today I went down to pick up my box. The box was completely intact, with two clearly printed labels with the correct address. So why it was sent to the wrong county will just remain a mystery. I'm glad it's in my hands, and in the coming days I'll pull a proof of some old block to see what I think of this ink. The tools supplement the supply I had, including a few sizes I didn't have. Now I just have to hope the class gets enough students to run. Back to work on the supermarket print today. If this sketch looks familiar it's because it's a reworking of the last one I had shown here. I dug up a softer (and thus darker) pencil and defined some things a little better- fixed a few things on the car being emptied of bricks, gave the two background cars more of a specific look. 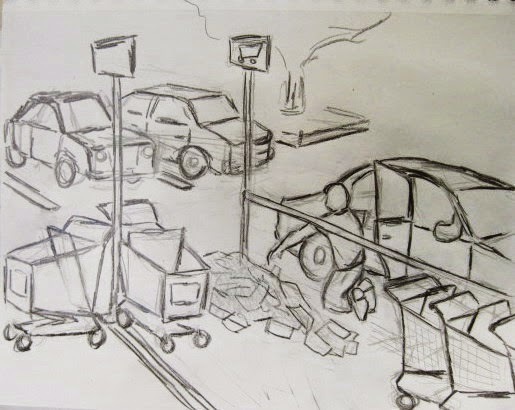 I redrew some shopping carts, more like what the final version will look like. I took the roof off the cart corral (most of the one at the store where this happened have canopies over the top, but a few are open like this), opening up the space a little. For this latest version I started sketching in a tree island in the back, but more will needed behind it- another car most likely. And I'm sure that I'll have a person or two walking through the area. 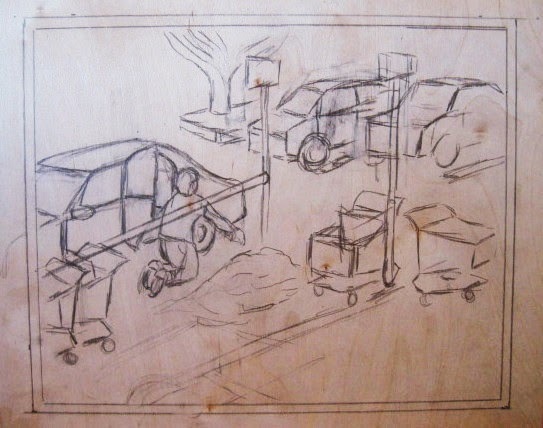 I figure to have all this worked out by the weekend, and then start redrawing the scene with proper proportions, details, and perspective on the wood. Last week it was sunny on the two days that I teach, but every other day of the week it was raining or misty or other damp conditions that make painting a mural difficult. (this weather had a similar effect on me mowing my parents' lawn, finally dealt with after last week's Giants game) In contrast, the weather has been fairly nice this week. Yesterday was a day in the Studio to work on my latest print, so I devoted today to continuing work on the Boatworks mural. 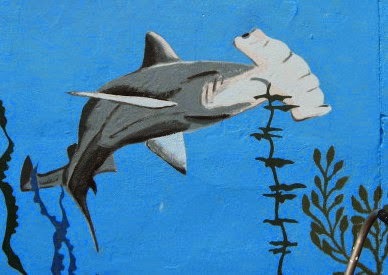 My last painting session I remarked to Pat that I thought my hammerhead shark from 2007 had held up well, but she felt it could use a reworking. 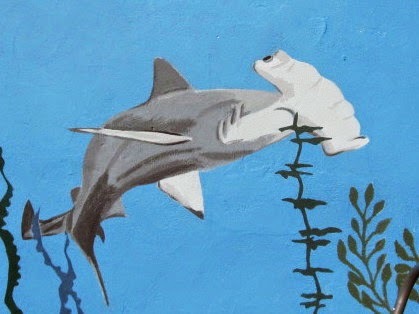 This repainting hasn't been strictly about perfect matching of the original colors, but in many cases colors have been intentionally made brighter and bolder, so I figured that meant I had to make the shark just a little more intense just to keep up. Above is a photo of how it looked early this afternoon, before the repainting. Below is the new version. The difference is more noticeable than my update to the squid a few weeks ago, but the original shark painting was mine, so I feel a little more comfortable making changes. There are some blended and mixed portions, but mostly I worked with three mixes. The lightest areas are mostly something just labeled as pastel base, a very pale blue, to which I added an unnamed medium blue similar to the water color, for a little more color than plain white. I played around a bit with the medium gray color, which has some of that light paint, plus more of the medium blue, a touch of an orangey mix I found, and even a little black. The darkest color is some of that middle value color, plus some very dark blue and a little more black. Mostly I stuck with the design from the original, but one obvious change was adding highlight and deep shadow sections to the dorsal fin. It certainly stands out a bit more. Seven years ago I had purposely subdued some of the colors I used to make it seem more like the fish, plants, and objects were being seen underwater and through water, but the current plan seems to be make everything bold. And on projects I'm not in charge of, I just do as I'm told. Time to get back to work on the latest print. I've done at least 5 or 6 sketches so far of this concept, but the perspective has been bothering me, so I decided a while ago that the next step would involve building a 3D model of my concept. 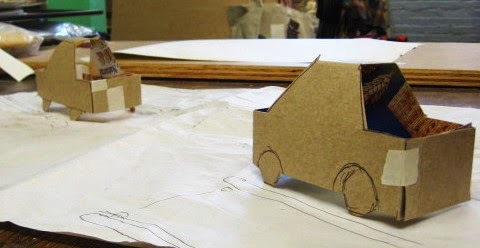 My first step today was to build a couple of toy cars- simple cut, fold, and glue models made from cracker and cereal boxes. 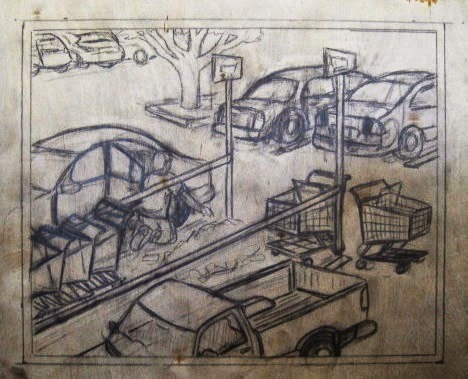 A large piece of scrap newsprint was lined to create a parking lot, and now I had something compact that I could draw. Above, the model cars, below, the latest concept sketch. Besides changing the angle and elevation a little, in this latest version the car and figure are shrunk a little bit to leave more room in the foreground, which will allow a larger brick pile. Lots more things to work out, but I feel the space works better in this one than any previous sketch. I stopped at this point because we had a visitor. 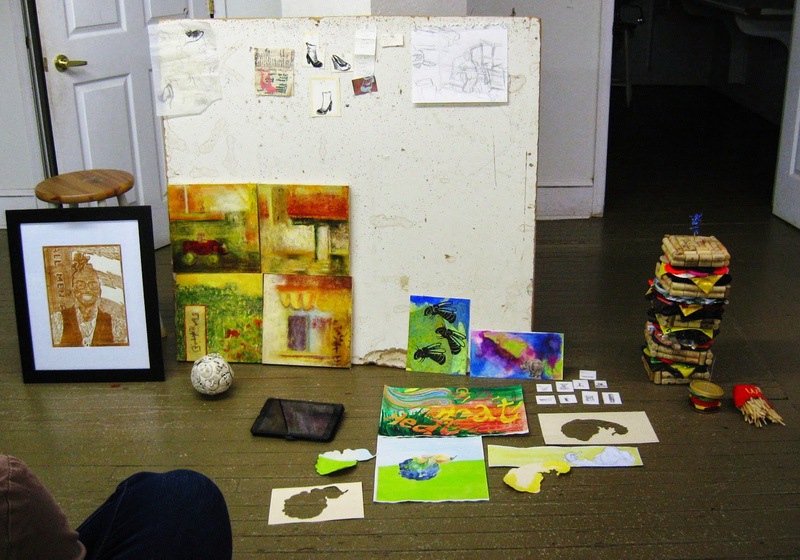 As we were cleaning up on Monday night after the critique group, Molly mentioned that she had heard from a printmaker possibly interested in sharing our space, someone new to the area. I agreed we should follow up, then went home. It had been a very long day between school and the group, so after downloading the photos and updating my class blog and this blog, I was done on the computer. 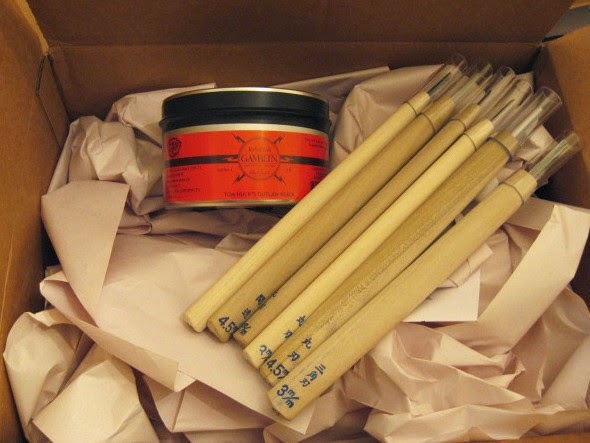 The next day I had time to check the mail box from my main website and found an e-mail from a printmaker recently arrived in Ocean Grove looking to learn about printmaking in the area. In a town this small, this had to be the same person. In a brief exchange after that she said she had a lot of free time at the moment, so when I arrived in the Studio today I called her and invited her to stop by. And about an hour later she did, and ended up staying about a half hour. Catherine is indeed a printmaker with Jersey roots, but living out of state out west for quite a while. Her current east coast residence is temporary (she had to leave her press and most of her possessions back home) for an indeterminate time, but she'd like to get involved in printmaking, teaching, art, etc while she's here. Molly arrived to do some work during this time and got to introduce herself as well. Don't know what, if anything, will come of this, but it's always good to have another printmaker in the around. We had a couple of months over the summer with low turnout at the crits, but it seems that artists are now ready to come back and show and talk art. Although notice only went out yesterday afternoon, a little over 24 hours later we had 10 people in the Studio, and 8 with art to show. The most recent layout sketch for my supermarket rubble piece is a the top of the tack board, and leaning against the board (from left to right) Mary L's completed portrait piece, four mixed media paintings from Sheilagh, two paintings and several small sketches form Mary G, and some found object food sculptures form Lisa. On the floor in the foreground, Margery's ceramic ball of faces, a computer pad from Harriet with images of a painting and the commercially made blanket derived from it, and a bunch of mixed media pieces from Molly. 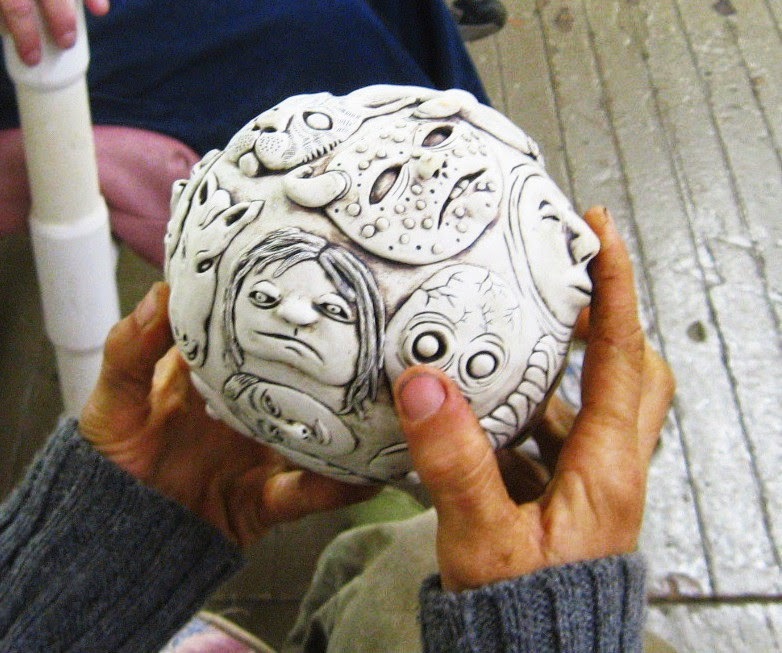 Above and below are two views of Margery's ceramic piece, a sphere made up of dozens of interesting faces- mostly human, but some animals are mixed in. Mary L had seen an early sketch of my new supermarket print last month, but it was new to everyone else. After a quick overview of the nature of the series I described the story behind the image. Ideas raised included making it more a night scene (I had mentioned it was around dusk when the event occurred), and exaggerating the size of the pile of bricks removed from the car. I'll consider both. 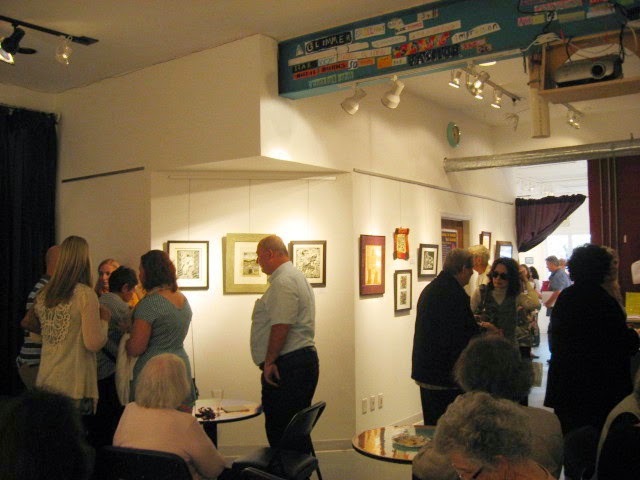 Tonight was the opening reception for the Grass Roots show at the Belmar Arts Council, an exhibition of work from participants in the various classes, workshops, and interest groups going on at the Boatworks this past year. 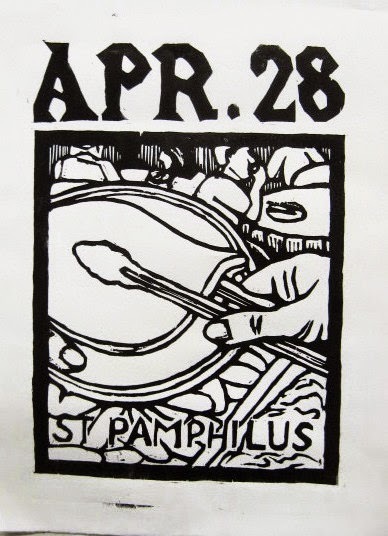 My main interest in this show is the woodcut students, whose work I hung last week. We got a decent crowd, and 5 of the 7 woodcut artists put in an appearance tonight, anywhere from a few minutes to a few hours. I used the opportunity to talk up the class to gallery visitors- the next round of classes comes in a few weeks. This show is up for 5 more weeks, plenty of time for people to see it and learn about the woodcut class. I've been giving lots of thought to the latest print, a new part of the supermarket series, but various things in life have kept me from getting much done. I hope to work on it more next week. Still got to the Studio today for another regular purpose- using the space to get my grading done. This semester I have a 2D Design and a Basic Drawing. The classes will go in different directions, but the first few weeks have some common exercises and projects. This week on Monday and Friday each class did their final line drawing project, and next week both will move on to charcoal, though after that they diverge. Having them on similar plans for a while is efficient- same set of props for both still lifes, and one grading session for both classes. 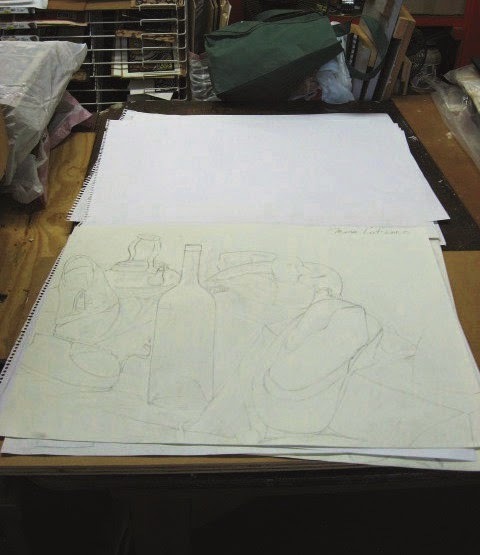 Part of the grading was done in the classroom, evaluating accuracy and completion from the student drawing positions and looking at the still life set up as they saw it. Other aspects of the drawings (line quality, etc) can be dealt with later, and today was that day for both classes. The big table and excellent light make it a much better place to work than my apartment, and I got that done. Next stop- art opening in Belmar.